Your monthly house payment may look affordable, but consider some ways to pay down your mortgage more quickly while paying less interest over the long run. The average sales price of homes across the U.S. are steadily rising. In just the last year alone, the National Association of Realtors reported a 5.8% increase in the sales price of existing single family homes, bringing the new sales price median to $235,000 at the end of July, up from $225,000. If you recently completed a PCS, then chances are you paid more for your home than you would have if you'd moved last year. If you bought a home at roughly the median house price point at a decent interest rate, particularly if you are a military family who uses a VA Home Loan, then your monthly housing payment should look quite affordable. However, for that median priced home of $235,000 with an estimated 4.25% APR on a 30-year loan, you will pay almost $420,000 for that house. That means you’ll pay over $180,000 in just interest alone. Ouch! That works out to about $6,000 per year in interest, with most of it front-loaded in the mortgage. Let’s look at how you can save at least $30,000 of that interest in these three easy tips to pay down your mortgage more quickly. 1. Set up bi-weekly payments. 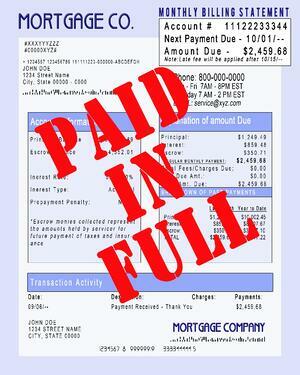 Many lenders allow you to set up bi-weekly payments instead of once a month payments. This breaks your payment into smaller, more manageable chunks, but it also means that you will make one full extra mortgage payment per year. By following this method, you will bring down that mortgage interest from $180,000 over the life of the loan to roughly $150,000, a savings of $30,000. You’ll also pay off your mortgage a full four years ahead of schedule. The one drawback to this method is that twice a year you'll make three payments in a month. In other words, if your mortgage was usually $1,100, and you break it into bi-weekly payments of $550, then you will have three payments of $550 during two months of the year. My husband and I did this quite effectively with a 15-year mortgage, calculating that the bi-weekly payments brought the total term of the loan down to just over 13 years! You can essentially achieve the exact same results as a bi-weekly payment without having to make changes to your monthly payment by setting up an auto-draft allotment of just $50 every pay period. That’s an additional $100 per month or roughly $1,200 per year that will attack your mortgage interest and principal. The key is that you must set up the allotment to state “for principal only,” so that the lender can only apply it to the principal on the loan. If you follow this method, you'll also save about $30,000 in interest over the life of the loan, and you’ll pay the loan off four years ahead of schedule. The benefit this allotment method has over the bi-weekly payments is that you don’t have to worry about making an extra half of a mortgage payment twice per year. The drawback, however, is that you may miss payments when you change your allotments after arriving at a new duty station. It’s also easier to stop the allotment than it is with a bi-weekly payment schedule with your bank, so it may be too much of a temptation around the holiday season or any other shopping season (shoe shopping season, anyone?) when you want to access a quick hundred bucks. 3. Refinance into a shorter term. While the Dave Ramsey style debt snowballers advocate for 15-year mortgages, we looked at those numbers before in our post A 15 or 30 Year Mortgage for Financial Peace?, where we determined that shorter mortgages don’t always make sense for military families. While it’s best to never take out more in a home loan than your family can afford, the problem is that military families never know when Uncle Sam may require them to move. This means that they need to budget in case they wind up stuck with a house payment at their previous duty station in the event that they can’t either rent or sell quickly. Refinancing into a shorter term is a popular option; however, you have to factor in closing costs and determine how long it will take before you break even. If your goal is to reduce your debt and not just reduce your monthly payment, then consider one of the first two options instead so that you don’t have to add potentially an additional $10,000 or so in closing costs onto your total mortgage debt. Stay updated with the latest information from MilitaryByOwner! Click below to subscribe to our newsletter.